A complete tool for AP Statistics Exam preparation. 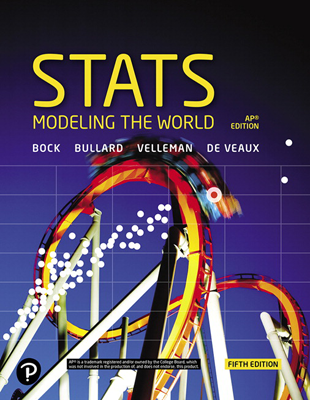 Chapter-by-chapter correlation between key AP Statistics test topics and the corresponding chapter and section of Bock/Velleman/De Veaux, Stats: Modeling the World, 5th Ed., AP® Edition. Detailed AP Exam test-taking strategies and insights into exam grading procedures. •Hundreds of practice study questions with answers All corresponding chapter-by-chapter with the textbook are written by experienced AP educators. Four complete practice examinations in AP Exam format and answers that closely resemble those on the AP exam that students will face in May. Comprehensive guidelines for mastering each type of exam question including multiple choice and free response, as well as explanations for both correct and incorrect choices.